Centrist party Kadima, led by Foreign Minister Tzipi Livni, has beaten right-wing Likud, led by Binyamin Netanyahu, by just one seat in the Israeli elections, but both are claiming victory. Both Livni and Netanyahu are vying for the position of Israel’s new Prime Minister, and each has a different approach to the issue of national security. The Ultra-nationalist party Yisrael Beiteinu is forecast to come in third, pushing Labour into an unprecedented fourth place. But what can Israelis expect from their newly elected leader – whoever it is? Peace prospects between Israelis and Palestinians could not look worse. Hot on the heels of the war in Gaza, Israelis went to the polls Tuesday no longer trusting their neighbours or even their own leaders. 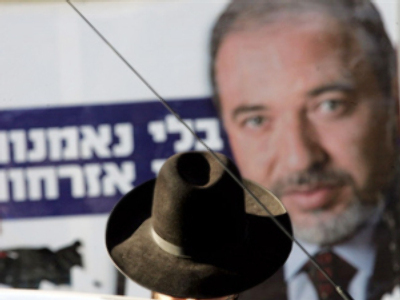 In one of the most tightly contested elections in Israeli history, one of the more popular figures to emerge was right-wing leader Avigdor Lieberman. His rhetoric is inflammatory and he’s called for Hamas to be completely wiped out. It’s a message that appeals to a public that’s becoming increasingly afraid. First exit polls suggest Tuesday’s election was won by Tzipi Livni. But her victory will be short-lived if she cannot form a majority coalition government in the coming weeks. It won’t be easy and she might be forced to approach Lieberman’s group. But then, if her government exists only because of him, it will not represent the cleaner brand of politics she promised her supporters. “I intend to continue the peace process. I intend to do it responsibly in a way that first and foremost represents the interests of the state of Israel,” Livni said. Throughout her campaign, Livni was hard pressed to show she was as strong as any of the men in her cabinet. The last time Israel had a female Prime Minister was 40 years ago with Golda Meir. Founding Prime Minister David Ben-Gurion had described Meir as “the only man in my cabinet” – a supposed compliment for a country that is constantly in a state of war. Aware of this, Livni never pushed the feminist agenda because she was afraid it might soften her image. Although among her most ardent supporters were female voters. More than 60% of Israelis turned out to cast their ballots, proving the pollsters wrong and showing that while there is voter apathy, for many Israelis this was an important election. Can Israel afford a lurch to the right?